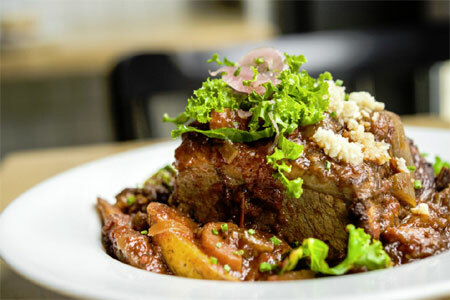 : 6 to 28th St.
Gramercy Park Mexican---come for the happy hour, stay for the mole. : This place is jammed even on a rainy weekday night. 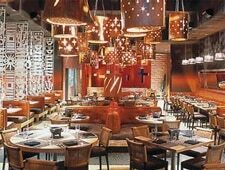 Designed by Yabu Pushelberg, who did Blue Fin's dramatic interior, Dos Caminos is lit like a Baja beach at dusk; sconces bring out the walls' dark-orange sunset hue and giant hanging wood lanterns lend a makeshift tiki-lounge feel. Showy (but unoriginal) touches like guacamole made tableside in a molcajete set the overpriced tone. While some dishes, like an okay platter of enchiladas with rice and beans, can be had for a fraction of the price elsewhere, others impress with complex spicing and technique. For example, try the grilled shrimp quesadillas, served with smoked wild mushrooms and oven-dried tomatoes, or any of the three types of ceviche: tuna, shrimp or lobster. Like Ruby Foo's, Dos Caminos is a good post-work place to order a slew of crowd-pleasing appetizers (soft tacos, empanadas, Mexican three-cheese fondue) and cocktails (there are two bars). The 150 types of tequila---including $45-a-shot Herradura Seleccion Suprema---are served as apéritifs and digestifs. Order your choice with a chaser of sangríta, a savory tomato concoction that puts all Bloody Marys to shame.